Archbishop Smith has asked me to become the parish priest of St Austin and St Gregory with St Anne, in Margate. 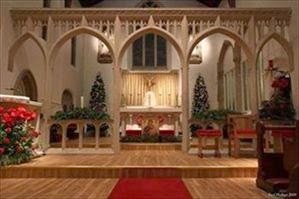 Fr Steven Fisher will become the parish priest of Our Lady of the Rosary, Blackfen. The moves will happen in the first week of September. As I have been seventeen years in Blackfen, this will be a major change in my life. When a priest moves, it is more than simply a change of "job", it is also a change of house, and more importantly, a change in the network of parishioners, colleagues, friends, local people you meet in the street, and generally many of the relationships that a parish priest grows into. At the same time, there is the prospect of a new adventure. A beautiful Church, a seaside town, the challenge of ministering to people on holiday, a well-established and thriving parish, all make for something of a buzz as I begin to take it all in. So it will be sad to say goodbye to so many lovely people for whom I have been their priest for a significant time, but also exciting to "reboot" my priestly ministry so to speak. To be honest, I never thought of asking to move from Blackfen. I made a promise of obedience to my Ordinary when I was ordained; without wanting to be flippant, this does not impinge on one's life ordinarily in day to day priestly work, but it sure does when you are asked to move. I have always taken the view that if you take the opportunity to exercise obedience in such a significant matter, then God will look after things in ways that are not necessarily obvious in human terms. Do say a prayer for the parishioners of Blackfen and Margate, and spare one for me over the next three months.